Earlier this month, on World Environment Day, the Executive Director of UN Environment, Erik Solheim, and I jointly stated that the historic moment has arrived for the United Nations to recognise the human right to a healthy environment at the global level. The fundamental UN human rights treaties do not include this right because the modern environmental movement began in the late 1960s, just after the adoption of the two International Covenants on human rights, and twenty years after the adoption of the Universal Declaration of Human Rights. Since then, however, it has become clearer with every passing year that a healthy environment is as necessary to human dignity, equality and freedom as any other human right. Unfortunately, the link is most obvious when we see the illness, destruction and death that result from pollution, toxic substances, and other forms of environmental degradation. Over one million children die every year as a result of air and water pollution alone, and the lives of countless more children and adults are shortened or blighted because of their exposure to unsafe environmental conditions. Moreover, environmental harm is inherently discriminatory, affecting those who are already suffering other human rights abuses. Climate change and the loss of biodiversity threaten even worse consequences for future generations. In my work as the first UN Special Rapporteur on human rights and the environment, I have documented many ways that environmental harm interferes with human rights, including the rights to life, health, food, and water. At the same time, I have described how the exercise of human rights can strengthen environmental protection. When people enjoy their rights to information about environmental threats, to participation in environmental policy-making, and to access legal remedies for harm, they can and do fight to ensure that they are able to live in a healthy and sustainable environment. States need to do much more to protect those who exercise their rights of freedom of expression and association in relation to environmental issues. An average of four environmental defenders around the world are killed every week, and many more are harassed, suffer violence, or are unlawfully detained or imprisoned. We cannot achieve sustainable development if we do not protect those who are on the front lines of environmental protection. Recognising the human right to a healthy environment would not solve all environmental problems, of course. However, as Erik Solheim and I stated, doing so would make clear that a healthy environment is on the same level of importance as other human rights. The recognition of the right to a healthy environment is not a new idea. More than 100 States already include the right in their national constitutions, and many more have recognised it in legislation or in regional agreements. The right is also understood to be inherent in other human rights, including rights to life, health and an adequate standard of living. The connections between human rights and the environment have also been increasingly recognised at the United Nations. In December 2015, the Paris Agreement on climate change included a strong reference to human rights; in March of this year, the Human Rights Council renewed the mandate on human rights and the environment for another three years; and at the same time, UN Environment announced a new Environmental Rights Initiative, which will promote rights-based approaches in environmental policy. The time has come for the United Nations to take the next step: formal recognition of the right by the General Assembly. Recognition could take various forms, but the simplest may be adoption of a resolution. This approach would follow the path taken by the rights to water and sanitation, which were similarly omitted from the foundational human rights agreements, understood to be inherent in them, and finally recognised by the General Assembly in 2010. Traditionally, States have been understandably reluctant to recognise new human rights in the absence of clarity about the rights’ content. The right to a healthy environment does not face that problem. One of the primary purposes of my mandate over the last six years has been to clarify the human rights obligations relating to the environment. That effort culminated in the presentation to the Council in March 2018 of Framework Principles on Human Rights and the Environment. The Principles reflect and codify how human rights bodies have applied existing human rights norms in the environmental context. They include, for example, obligations relating to freedom of expression and association, to information, participation, and remedy, to non-discrimination, and to indigenous peoples and traditional communities. While the Framework Principles are certainly not the final word, they do provide a sturdy basis for understanding and implementing human rights obligations relating to the environment. As a result, the “human right to a healthy environment” is not an empty vessel waiting to be filled; on the contrary, its content has already been clarified, through recognition by human rights authorities that a safe, clean, healthy and sustainable environment is necessary for the full enjoyment of the human rights to life, health, food, water, housing and so forth. Here, too, the right is similar to the rights to water and sanitation, whose content had been addressed in detail by the Committee on Economic, Social and Cultural Rights and Catarina de Albuquerque, the first Independent Expert on the issue of human rights obligations related to access to safe drinking water and sanitation, before the General Assembly acted in 2010. Even without formal recognition, the term “the human right to a healthy environment” is already being used to refer to the environmental aspects of the entire range of human rights that depend on a safe, clean, healthy and sustainable environment. The use of the term in this way — and, for that matter, the adoption of a resolution recognising the right — does not change the legal content of obligations that are based on existing human rights law. Nevertheless, it has real advantages. It raises awareness that human rights norms require protection of the environment and highlights that environmental protection is on the same level of importance as other human interests that are fundamental to human dignity, equality and freedom. It also helps to ensure that human rights norms relating to the environment continue to develop in a coherent and integrated manner. Recognition of the right by the General Assembly would further strengthen all of these benefits. As Victor Hugo famously said, it is impossible to resist an idea whose time has come. The time has come to recognise the human right to a healthy environment. 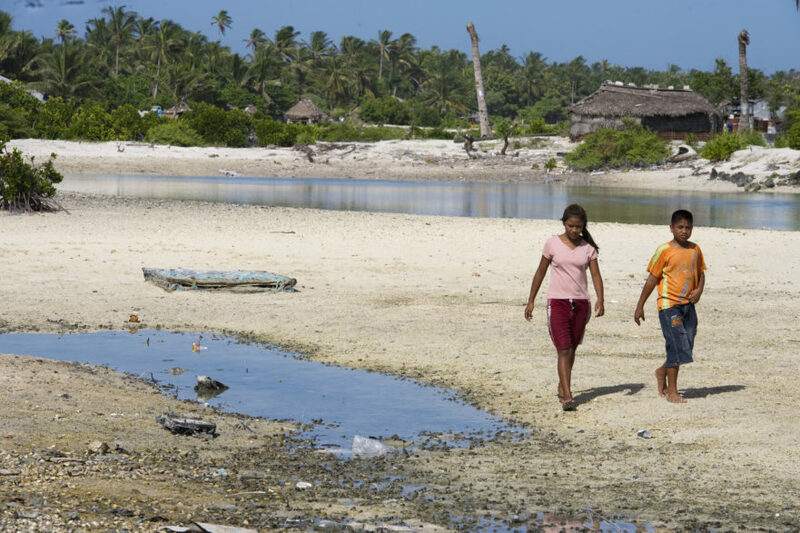 Feature photo: Locals in Tebikenikora, a village in the Pacific island nation of Kiribati which is affected by Climate Change, 4 September 2011, UN Photo/Eskinder, licensed under CC BY-NC-ND 2.0.